Posjeti stranice na hrvatskom (Croatian). Support our CROWD FUNDING campaign! Show Atelier Janja Gora on a bigger map. LunchtimeThese page is designed to give the informations to tourist agencies and organizers of manifestations, trips or other excursions for groups of people interested in visiting less known parts of Croatia and our atelier. 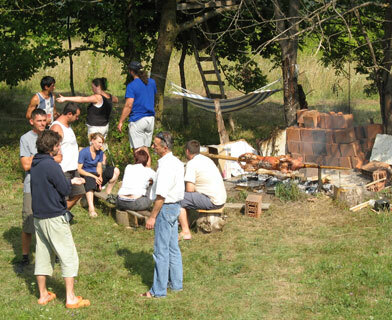 For the informations about prices and possibilities please mail or phone at + 385 (0)95 911 86 29.
International ceramic centre Atelier Janja Gora plays important	part	in development of the rural tourism in less developed areas of Croatia. This kind of tourism means very often the recreative, sport or agricultural tourism, and events tourism connected with specific event in the area. At the Atelier Janja Gora we go a step further and offer a combination of tourism, culture and creativity. At our place visitors can enjoy the beautiful surroundings, but can also take a part in a creative workshop, or can take a guided tour along the natural and cultural sights of the area. At the base of our philosophy stands the creative expression that offers people a feeling of satisfaction and fulfillment of deeper inner needs. Many times in our practice we have witness this kind of experience by participants of our workshops. Away from the daily routine and pressure and political, economical, religious, and cultural differences visitors can fully participate in personal expression. Without having to have previous knowledge or experience with the material they can connect to a praisconic elements and seamlesly bring whole day enjoin working without noticing that the day has passed. In ever evolving world of team building programs we offer something that can bring people together in a creative way. 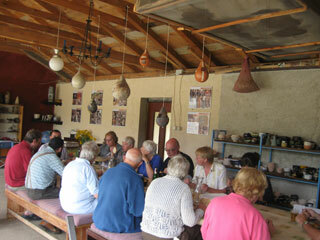 Group of people can cam and work together on a sculpture of clay, designing and building it. They can immerse them selves in the building small structures lika benches, houses or something abstract, discovering that way deeper senses and potential of one another. Walking on the mix of clay on the bear feats works very relaxing and one would be amazed with the benefits that this kind of teambuilding can offer. Participants of this workshops actively participate in making food on the outside open fire, making and baking bread in our bread oven. And if there is enough of this 'hard' working, they can take a brake and go for a walk or biking in the surroundings while the diner has been prepared. Ceramic works (sculptures, murals, etc...) can afterwards be brought and installed in the company space as a reminder of this team building experience. The same kind of workshops that we organize for the companies as a part of their team building program we offer to organized groups of tourists. If organized by a tour operator al of the parameters of the visit to our atelier can be set in advance or can just be let to 'happen'. A specially interesting can be working on the potters wheel, or decorating one already made piece, participating in its firing and taking it home with you as a self made souvenir. Ceramic pieces made this way always have something to do with our region and surroundings and are for that mater unique souvenirs of the country. Used techniques are suitable for everybody and are very easy to work with, so that the fun can be shared among the whole group. Al our workshops and programs can be adjusted to the needs of a special target groups like children, youth, elderly or any other group with special needs and ideas. That way we can organise history seminars for the students about the prehistoric ceramics and residences of the region Japodes, that have lived here and have developed a very fine culture and art. To the art schools and academies we offer a working space to explore and learn to know different ceramic techniques and possibilities a specially in regard to firing of the ceramics. 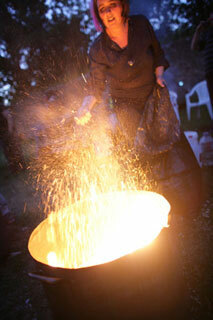 Our atelier is situated in a wide open space where al kind of firing techniques like woodfireng, pitfire, raku and others can freely be explored. Atelier Janja Gora is also equipped to organize mobile workshops. If you regularly organise events for groups of people we can help you making it even more interesting and fun by performing our clay and firing performance. This means that in case of special events and occasions, we can come bringing al of the necessary means for visitors of the manifestation to work with. Besides a clay and tools for working with it, we bring our kilns and pre made ceramics that can be decorated, fired and taken with in the same day. This kind of workshops are very suitable for camping and other spaces with many people and need for some (creative) activities. If you are planing to organize this kind of event and want to have a ceramics that carry your personal or corporate identity please take in to the consideration time needed to prepare everything (min. 2 months before manifestation). Besides al of the mentioned 'clay' activities, members of Atelier Janja Gora can provided professionally guided tours in the direct surroundings, but also in other parts of Croatia. One of the founders of the atelier is licence tourist guide for the regions of mountainous Croatia (Plitvice lakes, Kapela, Velebit, Gorski Kotar), Istria and Adriatic coast and islands. 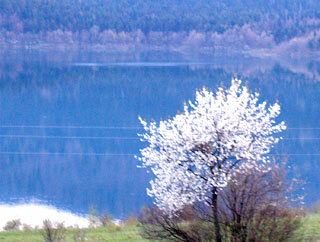 We can provide you with inspirational and very informational guidance in citys and rural areas of this part of Croatia. Included in this tours are many extra possibilities as rafting, cykling, walkings, visits to Bihać (Bosnia and Hercegovina), visits to castles and ruins, etc. More about this programs you can read on the roughguide pages. One of the greatest things of continental Croatia is the availability of the home made food. Even doe lots of people have stepped over to the supermarket food, a tradition of home food production is still very strong, offering a wide range on flavours and taste of this rough and yet delicious places. We as a small community have start it encouraging local people to turn back to the traditional farming and food production, doing it on the very edge of them giving up because of the lack of market and ever pushing food industry. We our self at the atelier have contribute a small part of this healthy food production. We have our own vegetables, eggs, potatoes, sheep, and are doing our best to promote and produce as much as possible this local flavours. The rest of the food that we offer at our place comes as much as possible from the farmers from the direct surrounding. We demand from them to produce the healthy food on the traditional ways. In return, we buy many of our supplies from them, providing an income and motivation for them. That way people visiting our atelier	can	taste a variety of local products and have the opportunity to visit the producers and purchase some of this products. By doing this we support the development of the local community on the ground of available resources, knowledge and experience. It places all of our programs and activities in one bigger picture that makes good sense for our atelier, our local community and our visitors. You are welcome to come and taste it for your self. If you decide to come visit as and participate in one of the above programs we can offer you a modest sleeping accommodations. At our disposal we have a several private accommodation possibilities. This possibilities are not big, but are sufficient to accommodate the participants of our programme. This accommodations are in a range of 8 km from our atelier and offer al of the necessary comfort. It is the house with 5 bedrooms and two bathrooms. Together with the kitchen and dining room it can accommodate up to 15 people. House has a parking space and the bike storage space. If you would like to use a hotel accommodation in our further neghberhoud (20 and 30 km)you find 2 hotels, one 3 and one 4 stars hotels with al of the necessary accommodation. By giving your self up for one of our programs you should also give up what kind of accommodation you would like and wether you are going to arrange it your self (hotels) or you going to make use of our accommodation (house). We believe that this kind of tourist arrangements significantly adds to the overall tourist image of Croatia.